» VeganMoFo: Gremlins Don’t Eat Off The Sidewalk! 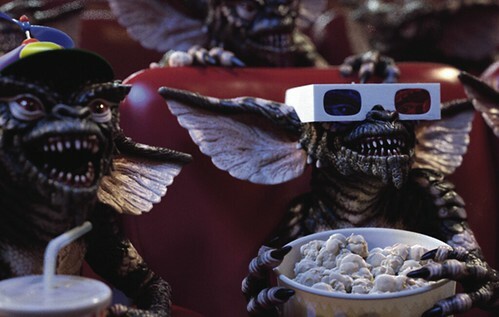 I always forget how awesome Gremlins is, until I watch it or even talk about it. It took me way too long to get this entry up, because I could not stop reading quotes, laughing at video clips, and trying to decide which screencaps to post. I learned so much about the movie today, I never knew that Howie Mandel did the voice of Gizmo! I don’t think I ever really got the dark side of Gremlins when I was little, I just thought it was funny…although anytime I hear ‘Do You Hear What I Hear’, I get a little nervous. 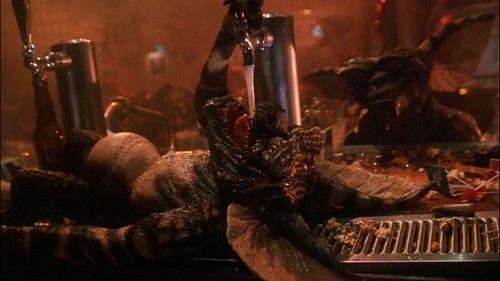 Gremlins is actually one of the movies that made the MPAA say, “Hey…maybe we need a rating between PG and R.”, because this movie was released as PG, despite the violence and (spoiler alert) grossness of things like a blended or melting gremlin. So it is perfect for kids who want to watch a scary movie, but aren’t ready for Saw (you should save that until they’re like, what, 10?). Like Carrie, I just assume that even if you haven’t seen it, you know what it’s about. Cute, strange little creature multiplies when wet, turns into scaly green monster if it eats after midnight, the Peltzer family finds this out the hard way. Wacky hijinks ensue even more than usual, because Gremlins love hijinks! They also like caroling, watching Show White, and hanging out in bars. Featuring Phoebe Cates and Judge Reinhold (both from Fast Times at Ridgemont High), Howie Mendell (from that stupid gameshow with the suitcases) and an adorable, teeny Corey Feldman (from everything in the 80’s). Entree: Hopefully YOU won’t turn into a monster when you eat chicken-fried seitan (and hopefully you’ll ear t more neatly). There are a ton of recipes for it on the internet, for a more specific recipe, Vegan Dad’s looks good. Side: This movie is full of snacks, so snack away! Popcorn, beer nuts, anything else one would snack on at a movie theater or bar. Tempeh Wings? Jalapeno Poppers, mayhap? Nachos, which Jenojoon has made her entire MoFo theme which is awesome? Dessert: After all of that fried food and snacking, how about a nice, green smoothie? (Stephanie said I should post a screencap of the blender gremlin, but luckily I couldn’t find a decent one). Everyone likes their green smoothie a little different, but mine is always spinach, banana, unsweetened almond milk, and then whatever frozen fruit I have and protein powder. No ice, no water! Some people do kale, but my blender isn’t that great.